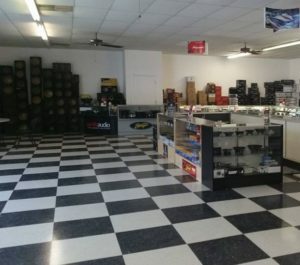 The premier car audio store in Pinellas County. Our car stereo store and warehouse has just been stocked full to the brim with the latest car audio equipment! We have all the top sound systems in stock. All of our car audio products are backed 100% by the manufacturer’s warranty and are available for immediate installation in our car stereo installation shop. We have grown to become one of the largest and most reputable car audio suppliers in the Tampa Bay Area. Our company is backed by our own car audio warehouse, so you will find exactly what you want and we will have it in stock. We have everything that you need to trick out your car or truck with custom sound and video systems. Whether you’re looking for in-dash video or headrest video monitors, we have the best car video products in stock- at the best price. Whether you want a new CD player or a complete audio and video system, you always get our customer satisfaction guarantee. We are centrally located at the northern end of Pinellas Park for your convenience. Free quotes for car audio installation. Call us or email us. Stay up to date! Be sure to become a fan of our Facebook page. Weekly sound system specials and the latest happenings down here at the shop!